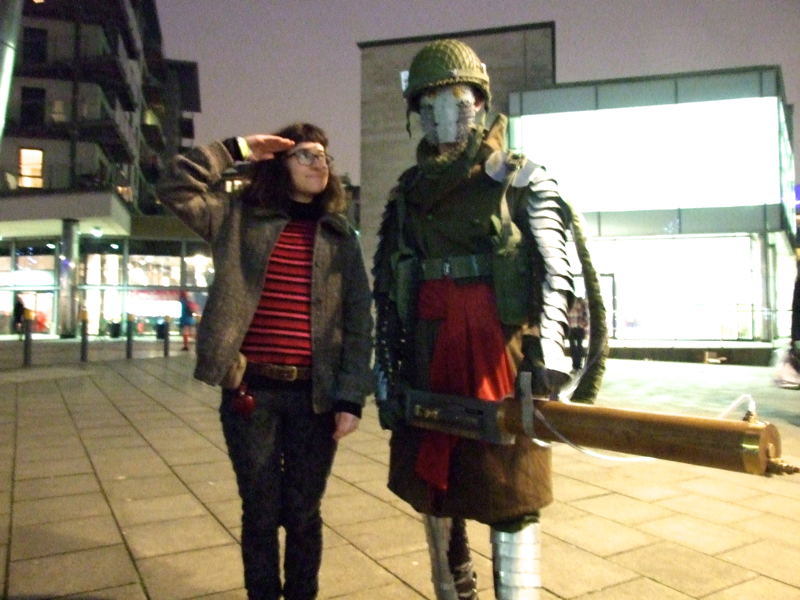 This weekend just past, Kelly Kanayama and I were both in Leeds, at Thought Bubble: the UK’s premier comics convention? I can’t promise that’s a fact, but hot damn, it’s a great con. Much content coming on that subject! But that’s for later. Thought Bubble does not have a very heavy cosplay focus; it’s the sparsest UK con I’ve been to on the costume front and the majority of the attendants, I would guess, regard the living characters roaming around as a bonus rather than a feature. For me, this is perfect. Not overwhelming, and you don’t find yourself constantly, by accident, photobombing Jean Grey as she shows Darth Vader exactly why a force choke isn’t a nice thing to do. And the quality of costuming is high! Perhaps best of all, there’s no hint of that internet-y question: “is the focus really on the comics any more?” Yes, at TB, it totally is. I took a few pictures with cosplayers that I’d like to share with you. 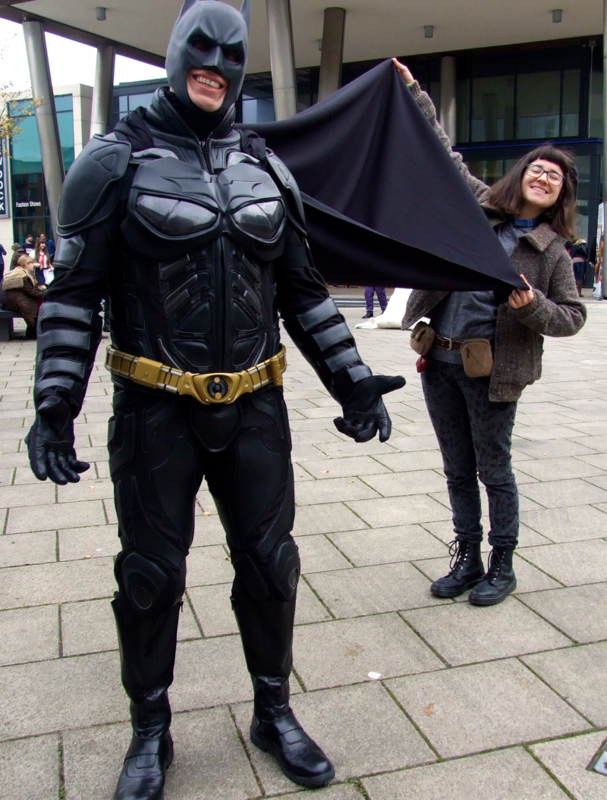 I only took photos for which I had “a concept.” You can find here is Captain America, here is Batman on any news site. Or Tumblr. On WWAC, you get the added bonus of me. Lucky! I didn’t take pictures with the child and baby cosplayers, because I don’t want to put other people’s kids online. This KILLED ME, because they were absolute darlings. Tiny barbarian girl! Little Thor! The ten year old Hilda whose eye I caught as she put her jacket on over the costume and took off the beret! A kinship moment. Girl, you looked great. I had a harder time thinking of concepts for several of the characters being represented. For example, I cannot believe it took me until 10 am on Tuesday, post-con, to realise I should have gathered all the Bees (I saw no Puppycats, he must have been resting) into a hive. Dolt! I had ideas ready for Kitty Pryde (classic armpit phase/stab), the two Lara Crofts (archery advice), and Judge Anderson (arm wrasslin’), but saw the first three only once outdoors and couldn’t catch Anderson alone (I’m shy, especially with the law). I’m a bit terrible. I’m irritated and regretful, but it was a sexist thing. Seven years in an all-girls school set a sort of psychological trap, which I continue to increase my awareness of. 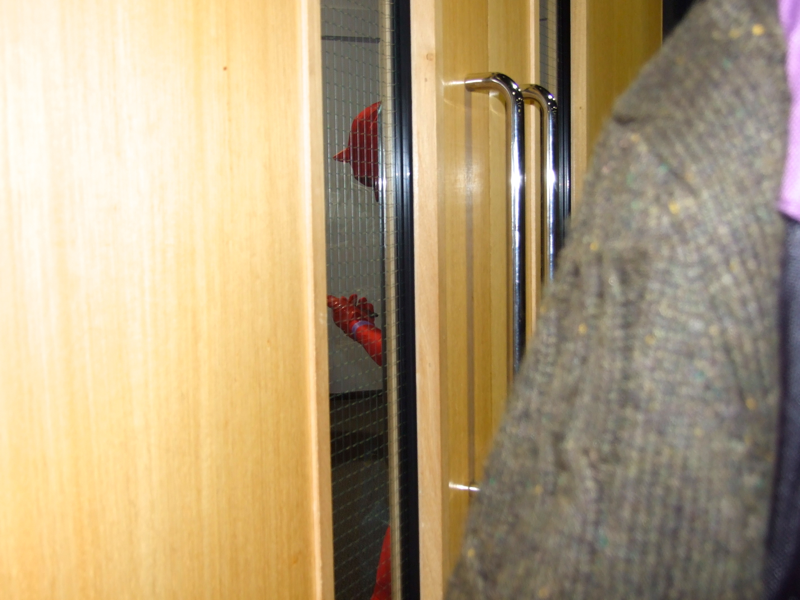 One day, I shall be free. Male peers… don’t exist in the same way that girls do. “Girls are my local community, at the school where I spend nine hours a day; they can destroy me.” I mean, they can’t — I’m just experiencing a political hangover, and my perception’s all dirtied. It makes it harder to approach strangers (already a stressful idea). I can only apologise. Y’all looked fantastic. Next year, right? This chap, who answered to “scary man” though that may not be his real name, was in an original design featuring elements from word militaries over a wide breadth of history. Creative and very heavy. Last year’s regret REVOKED, just like my creative license. 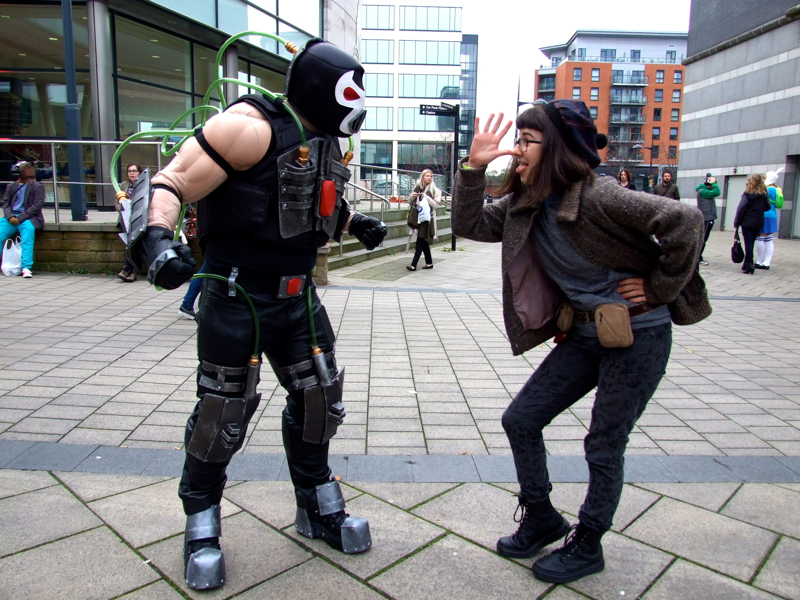 2000AD cosplayers are my favourite. They gave me a powerful thirst for historic British comics. 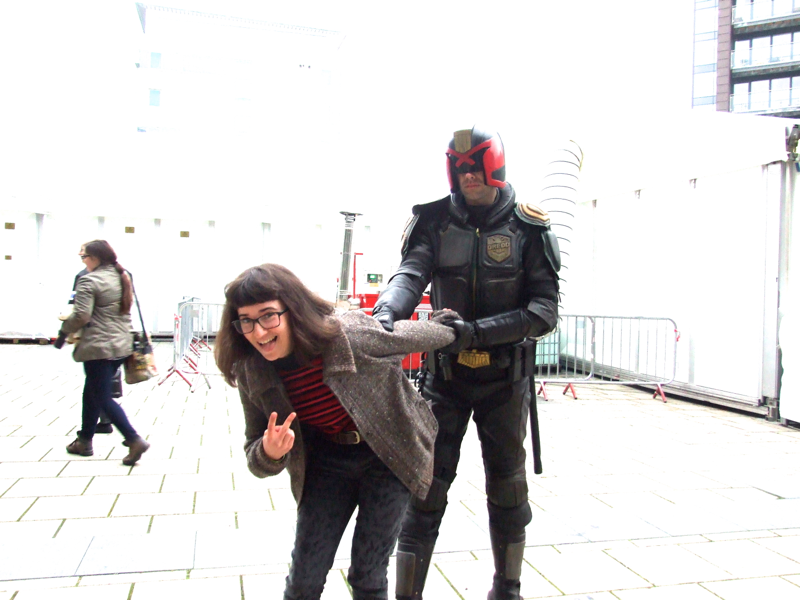 Isn’t the Dredd costume a classic? “Excuse me, are you in cosplay or just stylish?” She was the latter, and a fount of information about Doctor Strange and creative page layout. I took her card, but I took a lot of cards. WHO ARE YOU? I don’t think he’s even blind. Cosplay kids. I HEART YOU! …For dinner. “I’m quite heavy,” he said, when I shared my concept. “Just squat then,” I suggested, and he did. Classic Dragonball pooping pose for this A++ outfit. It’s so clean, so bright, so graphic! Toriyama, you know your business. And how about that wig? This guy’s arms are fabric. It’s a fabric muscle suit! How good is that? Excellent costume, even though apparently it’s quite brittle which is why my back remains photographically intact.